Hugging the frozen ground for the length of some 1280 kilometres, the pipeline in Alaska transports one of the biggest crude oil deposits in North America, starting in Prudhoe Bay and ending in Valdez. 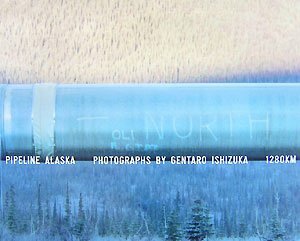 Gentaro Ishizuka, photographed the pipeline for three years, the results of his project are presented here one large full page colour photograph to a page. The photographs are also available in a limited edition ‘pipe’ production, with a paperback edition cunningly rolled in a tube.